One of the fun things about working at FreshDirect is that we get to meet a lot of passionate people. From farmers to entrepreneurs, there are so many people who love food and we learn a lot from them. 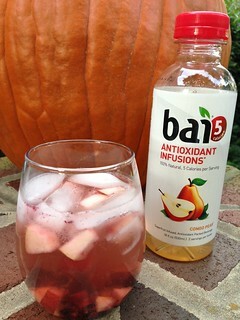 One of these entrepreneurs is Ben Weiss who founded Bai Antioxidant Infusions. These drinks are based on the coffeefruit: the casing that surrounds a coffee bean. He found this out while sourcing coffee. So he started making drinks out of the coffeefruit in his kitchen and then sold them out of the trunk of his car. We just started carrying these new products in the shop so to celebrate, his team came up with these fun mocktails and cocktails that are perfect to welcome the Fall season…. Filed Under: That’s the Spirit! Tagged With: autumn, cocktails, That's the Spirit! With picnics, potluck dinners, and BBQs galore this summer, I usually bring a fruit salad. 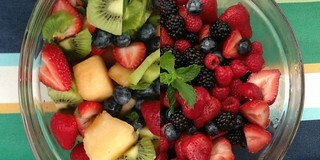 Fruit salads are easy, healthy, and require no cooking at all (which is perfect when the weather outside is steamy!). You might think that a fruit salad is fairly plain, but when you mix fresh, seasonal fruit with complementary homemade dressings, they become an elegant dish. I put together a couple of my favorite recipes below. Many of your favorite fruits will work in these recipes. The pièce de résistance is in the dressing…. 3 Fun Finds in the Shop! Challerhocker cheese is one of my favorite hidden gems in the shop! One of the fun parts about my job is that I often get to taste or hear about interesting products that come into the shop. The first hidden gem comes from our Cheese market. The Challerhocker is a raw cow’s milk cheese from Switzerland. Its name means “sitting in the cellar” – and the 10 months it has been sitting there lends to its creamy, salty, acidic, buttery and nutty flavors. There’s nothing that screams summer more to me than ice cream! Sweet, creamy, and cold – name a flavor and chances are I’ve tried it! A fun and easy ice cream dessert that brings me back to childhood is DIY Ice Cream Sandwiches. When I have friends or family over for dinner, I like to set up a whole DIY Ice Cream Sandwich buffet. 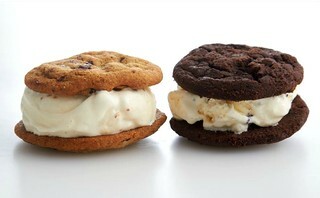 All it takes is a few pints of your favorite ice cream flavors along with plates filled with cookies. Star Spangled Cupcakes are fun for Independence Day parties. I love getting together with friends and family to celebrate the Fourth of July. Any excuse for good food and great company is fine by me! Since the holiday occurs in the summer, there are so many fresh red, white, and blue fruits available to make easy, but beautiful and tasty, desserts. Win $2000 in Prizes from our new Baby Boutique! What do you do with your FreshDirect boxes? So we thought: Our creative fans should be rewarded! And what better way to celebrate the launch of our new Baby Boutique than with a Family Fun Photo Contest? All you have to do to enter is snap a picture of how you and your kids re-purposed your FreshDirect boxes and fill out the entry form here. What could you win? 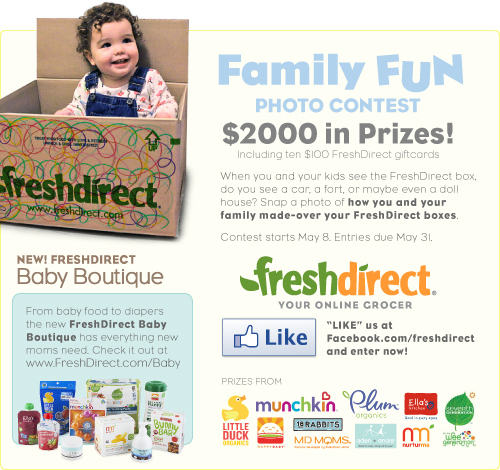 Up to $2000 in prizes is up for grabs including ten $100 FreshDirect e-gift cards and products from our new Baby Boutique.